Big savings on BIC’s closeout products. A nice variety of promotional pens and a few other BIC items. Several products are discounted by more than 50%! View our BIC Savings Promo here (PDF 783kb). With thousands of college football fans celebrating the the 2010-2011 season, the Promotional Products Association International (PPAI), has released a list of the most popular college-themed promotional products to help any fan root their team to greatness. Tangible advertising used to promote products, services or companies, promotional products can be found almost anywhere and in virtually any form, even game day giveaways. College sports bring a very large and diverse mix of fans together. It’s not surprising then that everyone from insurance companies to telephone service providers jump at the chance to get in the game. Next time you’re cheering on your alma-mater or just lending your support to an underdog, take a second to look at the name on your koozie or rally towel, you never know when they might come in handy. A great way to get a prospect’s attention? Custom chocolate gifts. Few gifts will deliver the impact of chocolate. It excites the senses like nothing else. You’ll be the talk of the office when you drop off these tasty treats. 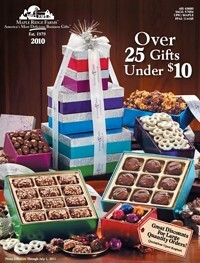 And there are so many options available that you can certainly create the perfect gift for your next promotion. My favorite is the Two Pound Executive Gift Bar. It’s a lot of chocolate, and can be custom molded with your logo and promotional message. 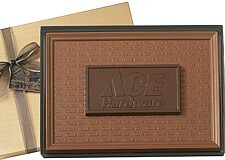 Available in milk chocolate, dark chocolate or as a two toned (milk and dark) chocolate bar. Another one of my favorites are the premium truffles in a beautiful gift box. Or the chocolate covered cookies. Or the chocolate covered nuts. Or the chocolate bars with custom wrappers. Yum. Click here to view just a few of our available options. You’ll be glad you did. And so will your customers! People often think of promotional products just as something used by the marketing department. But promotional products have many uses beyond typical marketing. We often work with multiple departments within a business including human resources, public relations, sales, and yes, marketing. Here’s a list of the top ten uses for promotional products. Learn more about promotional products from our Promotional Products Fact Sheet. 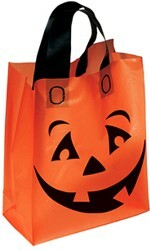 The midnight hour is quickly approaching, but there’s still time to order custom imprinted Halloween bags. My favorite is the Orange Frosted Pumpkin Shopper. Features a smiling jack-o-lantern on one side with educational safety tips on the back. Your logo can be imprinted above the safety tips. Includes black soft loop handles. The bag is 10″ x 13″ x 5″. A great giveaway to parents and children alike. We also have an assortment of plastic die cut handle bags available in orange, white or reflective silver. Halloween promotions are a fun way to promote your business and safety at the same time. My favorite candy? Yep. You guessed it. They’re M&Ms. I just love them. Plain. With peanuts. All the cool colors. Anytime. Anywhere. And I was even more excited when I found out that we could now sell M&Ms custom imprinted with your logo. Tons of colors to choose from so that you can pick the perfect assortment of colors for your next promotion. And custom packaging is available as well. Your next promotional campaign is sure to be a hit when you include customized M&Ms with your company’s logo. Can you believe the holidays are right around the corner? We have many great ideas about holiday gifts for your customers and employees. One of our favorites? Maple Ridge Farms. We’ve worked with them for years, and they’ve never let us down. Some of my personal favorites include the gourmet brownies and cookies gift baskets, and the gift boxes with nuts and chocolates. Maple Ridge Farms offers an incredible variety of edible treats and presentation choices ranging from wooden gift boxes to towers. And not only do they have tasty treats, they have ham, cheese and assorted gift tubs. Follow this link to their online catalog for tons of great ideas, then just give us a ring and let us know what you need! I am so pumped. Imagine the excitement, when out of the dark comes the Glow in the Dark Screaming White Snow Monkey. A promotional item sure to catch their imagination and attention. 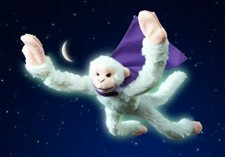 Why monkey around with boring promotions, when our Flying Shrieking Monkey will help your message soar?! Shoot it across the room and it screams back at you! Click here to open the full sales literature (145kb PDF). To see my original post about my Flying Marketing Monkey, click here. Help spread the word, October is National Breast Cancer Awareness Month. And if you’re supporting a charity or local fund-raising event, we have the perfect products to help you promote your business and raise funds for breast cancer awareness. Often these fund-raisers include golf outings and other sports events. Here are just a few ideas for incorporating pink products in your next event. 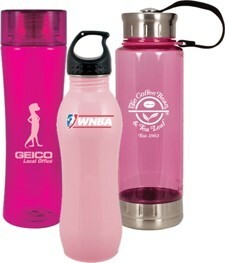 Pink Aluminum Sports Bottle: A PBA-free water bottle is perfect for 5k fund-raising runs and walks. Pink Foam Hockey Puck: Hockey teams at all levels can give out pink foam hockey pucks with information on breast cancer awareness. Pink Mini Replica Baseball Bat: Bats can be sold at games or online. Neat fund-raising product for baseball teams to raise money and call attention to the cause. Pink Boxing Gloves: Boxing promoters can use these gloves in a promotion to “punch out” a cure for breast cancer. Pink Polo Shirt: Real men wear pink, and polo shirts are ideal gifts for October golf tournaments. Pink Tie: Corporations big and small can provide pink ties to male employees to wear during October. Golf Balls with Pink Ribbon: A great tee gift giveaway at golf tournaments. Pink Mini Football: Pro, college, high school and club teams can raise awareness by selling logoed footballs or by tossing them into the crowd during halftime. Auto Racing Kit: Includes sunscreen, pain reliever, antacid, wet naps and earplugs, all in a pink pouch. Hospitals, doctors and breast cancer awareness activists can hand the pouches out at race tracks during October races.